This unique ecosystem, derived from the mediterranean forest mainly located in the south-east of the Iberian Peninsula, is what we call Dehesa. The term dehesacomes from the Latin word “defesa”, which means “defence”, “defended” or “forbidden”, that was related to the field delimited to the free-range grazing of the livestock. The ibérico standard defines the dehesaas a wooded surface with, at least, 10 trees per hectare. In Spain, the dehesasurface is mainly divided between Extremadura, Andalusia, Castilla La Mancha, Castilla y León and Madrid. It is mostly constituted by species such as the holm oak, the cork oak, gall oaks and some other tree species like the ash, the rockrose or the retama. 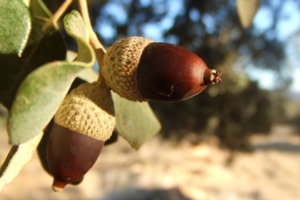 These type of trees, that come from the same family (Quercus), are the ones which generate the favorite fruit of the ibéricopig: the acorn. However, this kind of pig is not only fed on acorns; pastures, grass herbs and legumes that grow under these trees are also a fundamental part of their diet. The dehesa requires comprehensive care. Quercus need to have enough room to grow strong and leafy and, moreover, ibérico pigs must be able to move around freely and comfortably between trees and shrubs. As we mentioned in a previous post, there are several types of jamón ibérico, and not all the ibérico pigs are fed on this ecosystem with acorns and natural pastures. 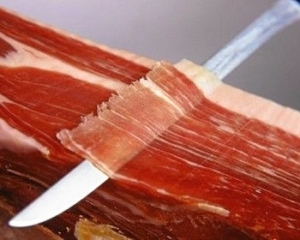 Only those whose jamones andpaletas will belong to the “bellota category” will be fed on dehesa. For you to have an idea, these pigs, during their last fattening period, end up doubling the weight they had at the beginning of the dehesain a period called Montanera. During this period, each pig can ingest between 6 and 10 kilos of acorns and between 3 and 4 kilos of natural pastures. Extensive grazing (freely) allows the ibérico pig to stroll along this ecosystem seeking its feeding and developing its physical condition. The exercise they do -they can walk up to 15 km everyday- initially slows their fattening, but facilitates the infiltration of fat in a natural way, which provides the flesh an amazing juiciness and an optimal texture. Moreover, this type of habitat gives them peace of mind, preventing them from suffering any type of stress. 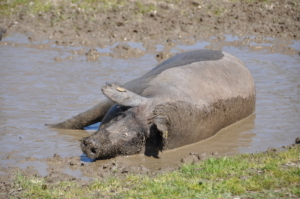 The ibéricopig contributes to the conservation and adequate animal husbandry of the dehesa. For that reason, we can say that the ibérico pig and the dehesaare a perfect combination. Guarantee the quality What does the Montanera consist of? What is it?